When the Bluefield Beavers head to Wheeling this Friday for their meeting with the Fairmont Polar Bears in the WVSSAC AA state championship, the Beavers will be in familiar territory. This season’s state championship berth marks the 17th time that Bluefield has appeared in the gold medal matchup. Bluefield has taken home the hardware in 11 of those 17 appearances. Those 11 titles are tied with now defunct Ceredo-Kenova for third all-time for the most football state titles in West Virginia. A 12th title would move Bluefield into sole possession of third place behind Parkersburg’s 17 titles and Wheeling Central’s 15. Wheeling Central looks to add its 16th state title this Friday when the Maroon Knights take on Williamstown for the A state championship. For Bluefield to win its 12th state title, it will have to do something that the story program has yet to accomplish. The Beavers made four consecutive appearances in the state title game from 2002-2005. Bluefield dropped decisions to Poca in ’02 and ’03 before defeating Wayne in ’04 and losing to Weir in ’05. In 2017, the Beavers knocked off Fairmont 29-26 in the state finals. On Friday, they look to melt the Polar Bears once again. In anticipation of Friday night’s rematch between the Beavers and the Polar Bears, let’s take a look back at Bluefield’s history in the big dance. On November 21, 1959, Bluefield traveled to Laidley Field in Charleston to take on Parkersburg for the AAA state championship. Russ Parsons and the Big Reds were looking to repeat as the state champions after defeating East Bank in 1958. Leading up to the 1959 showdown with Bluefield, Parkersburg posted a 8-1-1 record. The Big Reds tied Stonewall Jackson at 25 and lost a 14-7 contest to Weir in the week leading up to the state finals. As for Merrill Gainer and the Beavers, they posted a 10-0 record in the regular season. In Gainer’s first season as the head coach, the Beavers pitched shut outs against Graham, Big Creek and Welch. It was the first state championship appearance for the Beavers. The storybook season for Gainer and the Beavers received the ultimate exclamation point as they defeated the Big Reds 20-13 on their way to their first state championship. On November 17, 1962, the two teams met up once again in the state finals. Parsons and the Big Reds posted a 9-0-1 record before meeting up with Bluefield. Parkersburg tied Charleston and won tight contests against Wheeling and Weir on its way back to Laidley Field in Charleston. The Beavers rolled to a 10-0 regular season under Gainer in dominant fashion. The only team to score double digits against Bluefield that season was Oak Hill. Nelson Bragg’s team rolled up 27 points in a 53-27 loss to the Beavers. Gainer cruised to his second state championship in a 40-12 victory over mighty Parkersburg to put the cherry on top of the perfect 11-0 season. Perhaps, 1965 was Gainer’s most dominant year at the helm in Bluefield. On November 20, 1965, Bluefield faced a different opponent in its third state finals appearance—the Dunbar Bulldogs. Led by Delmar Good, the Bulldogs posted a 9-1 record on their way to a matchup with Bluefield. The lone loss for Dunbar came back on October 15thto Charleston in a 13-7 slobberknocker. Bluefield on the other hand, dominated each opponent on its path to a 10-0 campaign going into the state championship. Bluefield allowed 19 points all season long. Big Creek and Welch each scored six points on the mighty Beavers while Oak Hill added seven. Speaking of the number seven, that is how many opponents the Beavers shut out on its way back to Laidley Field in Charleston. It came as no surpris in the Mountaineer State that Bluefield shut out now defunct-Dunbar in the state finals 13-0 on the way to its third state title in six seasons. In 1967, it was much of the same for Gainer and the Beavers. Bluefield posted a 10-0 record while only allowing 32 points in the regular season. The Beavers pitched six shutouts in the regular season on their way to a November 19thshowdown with Stonewall Jackson at stadium field in Parkersburg. Bill Jarrett led the Generals to a 9-1 regular season. Under the direction of Jarrett, the Generals allowed a mere 30 points during the ten game campaign. The lone falter for the boys from Charleston was a 14-13 loss to St. Albans at home inside the confines of Laidley Field. Quarterback Dickie Ward, who went on to play at West Virginia University, led the Beavers. Ward is now the Emeritus senior Team Physician at Coastal Carolina. 1967 was the final state championship Gainer grasped during his time in Bluefield. After an eight-year hiatus from the state finals, the Beavers played host to the grandest stage. Behind eighth year head coach John Chmara, the Beavers posted a 9-1 record in the regular season, with the lone falter coming on the road at Welch. Bluefield blanked Buckhannon-Upshur in Charleston, 42-0, in the first playoff matchup, which gave it the opportunity to host the state finals at Mitchell Stadium. The Black Eagles soared into Mitchell Stadium with an identical season to that of their Beaver foe. South Charleston had fell in the regular season 14-12 to George Washington at home on the turf of Oakes Field. However, much like Bluefield, in their first playoff contest, the Black Eagles rolled the Patriots of Parkersburg South in a impressive 49-8 performance behind future LA Rams tailback Robert Alexander. Homer Criddle and his South Charleston squad fought the Beavers to their closest contest of the season. However, Chmara would lay claim to his first state championship in Bluefield at the end of a 20-7 Beavers victory. It took the Beavers nine more seasons to return to the finals under Chmara. After an 8-2 regular season, the Beavers moved past Woodrow Wilson and Brooke to set up a matchup against Barboursville at Laidley Field on November 30th 1984. The two setbacks in the regular season came to Mount View in a 9-7 decision and to rival Woodrow Wilson in a 20-13 matchup. The Beavers faced a tall task against a Jim Thornsburg led squad. Barboursville posted a perfect 12-0 record up until its December 1 meeting with Bluefield at Laidley Field. Bluefield pulled an upset, winning the game and the state crown 13-7. In 1995, the Beavers made their first appearance in the AA state championship contest when they faced the Musselman Applemen. The contest marked the first state championship appearance for Bluefield under the direction of current head coach Fred Simon. Bluefield lost two contests in the 1995 regular season to out-of-state foes—Graham(VA) and Pikeville (KY). However, the Beavers rolled into the state championship on a four game win streak over James Monroe, East Bank, Bridgeport and Poca. Denny Price led the Applemen into the matchup with the Simon-led Beavers with a 9-4 record. Musselman fell to Martinsburg, Southern Garrett (MD), Allegany(MD) and Hedgesville on their way to Wheeling Island Stadium. The Applemen handed Bluefield its first loss in the state championship in a 17-13 decision. It is the last time that Musselman won a state title. Fred Simon led the Beavers back to Wheeling in 1997 in impressive fashion. The Beavers posted a 13-0 record coming into the state title matchup with Grafton. Bluefield did not allow Greenbrier East, Tazewell, Pikeview, Poca, Mount View, James Monroe or Man to score more than seven points in a dominant season. Under Mike Skinner, the Bearcats from Grafton had also posted a 13-0 record coming into the matchup with Bluefield. The headlines were plentiful as this marquee matchup in Wheeling featured two of the states undefeated best. Bluefield came out on top and returned the gold to southern West Virginia with 42-13 thumping of Grafton to give Simon his first state championship. In 1999, Bluefield met up with Wyoming East during the second year of its existence. Under Simon, the Beavers posted a 13-1 record on their collision course to meet the Warriors. The lone falter came at the hands of Woodrow Wilson in a 24-21 contest. However, under Kevin Grogg, their was no slip ups for Wyoming East. After surviving a scare at Fanning Field against Iaeger in week one, the Warriors thumped everyone in their path. This included a 76-12 beat down of Sherman in the second round of the playoffs. This was not the only beat down Wyoming East handed down in the playoffs, as it moved past the Beavers in a 57-21 victory to move Simon to 1-2 in the big game. In 2002, Simon and the Beavers returned to the state finals to take on the Poca Dots. Under the direction of Bob Lemley, the Dots posted an 11-3 record with losses to Oak Hill, Herbert Hoover and Hurricane before rattling off five wins in a row heading into the hardware game with Bluefield. For the Beavers, they came into the matchup with the Dots with a 9-4 record. Bluefield had fell to rivals Graham, Princeton and James Monroe while also faltering to Oak Hill. The Beavers rattled off four wins in a row before the matchup on December 6th with the Dots, but the momentum was not enough as Poca won its second consecutive state title by a score of 27-7. In 2003, it was, as Motley Crue sang, the Same Ol’ Situation. Poca was looking for a three-peat and came into the matchup with Bluefield at 11-2. The Dots fell to Herbert Hoover and Wayne before they once again rattled off five consecutive wins heading into the state finals. Bluefield sat at 11-1 on its way to Wheeling Island Stadium with its line falter coming in week four in a 21-20 loss to Oak Hill. Fred Simon and the Beavers rattled off eight consecutive wins and had all the momentum in the world as they sought revenge on Poca. However, just as the Beavers had fell to Oak Hill in week four, they fell to Poca. By a single point. Actually, by the same identical score—21-20. Poca had accomplished the three peat and send Simon’s state championship game record to 1-4. After heartbreak in back-to-back seasons, the Beavers returned to Wheeling for the third consecutive year. This time, Bluefield faced a new opponent—the Wayne Pioneers. Both the Pioneers and the Beavers came into the matchup riding a 13 game winning streak. Bluefield posted two shutouts in 2004 against James Monroe and Mount View. Under Tom Harmon’s direction, the Pioneers also posted two shutouts against Winfield and Tolsia. The third time did prove to be the charm in the 2000s for Simon and the Beavers as Bluefield cruised to a 69-24 victory. The win gave Simon his second state championship and Bluefield its seventh state crown. In 2005, many people in Bluefield began to wonder if they needed to buy a vacation property in Wheeling. The Beavers made their fourth consecutive appearance in the state championship contest. This time, the Beavers met up with the Weir Red Raiders. Weir posted a 12-1 record on its way to the state finals with the lone loss coming to John Marshall back on September 30thin a 32-29 contest. Bluefield started its season 0-2 after losses to Graham and Princeton. The Beavers dropped two more against Herbert Hoover and James Monroe. Bluefield came into the matchup with an 8-4 record. The dominance of the Red Raiders carried over into the state title as Weir embarrassed Bluefield 40-0 on its way to the fourth state tile in school history. In 2007, the Beavers met up with a local power in James Monroe. Behind the late-Taylor Robertson at tailback, the Mavericks posted an 11-1 record leading up to a rematch with Bluefield in the state title. The boys from Lindside hoped to avenge a 14-7 loss to the Beavers back on October 26th. The Mavericks defense pitched shutouts against Oak Hill, Mount View and Liberty Raleigh. Bluefield, on the other hand, rolled to a 13-0 record behind Ansel Ponder and Will Cole leading up to the state title game. The Beavers shut out Princeton and Mount View and handed Richlands its second regular season loss in three seasons. In David Witt’s final game as the head coach at James Monroe, Bluefield gave Fred Simon his third state championship ring with a 20-12 win over the Mavericks. In 2009, Bluefield and Wayne met in a rematch of the 2004 state title game. The Pioneers shut out Keyser, Scott and Ravenswood on its way to a 13-0 season. Tom Harmon looked to get revenge on Simon and the Beavers after losing by 45 points five years earlier. Behind Jake Lily, the Beavers rattled off a 11-2 record on their way back to Wheeling Island Stadium. The Beavers dropped two decisions to Gate City and Charlotte Country Day. However, after the loss to Gate City, the Beavers rattled off eight straight wins. 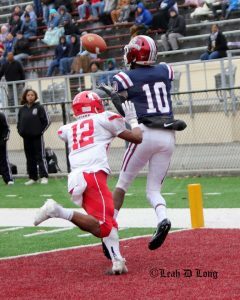 The ninth win came on December 4thas Bluefield once again found itself victorious over Wayne in a 27-7 ballgame. The win gave Simon his fourth title and Bluefield its 10thin school history. The latest state championship appearance for the Beavers came a year ago in Wheeling against the Fairmont Polar Bears. The Polar Bears were led by first year head coach Nick Bartic. In his first year, Bartic led Farimont to a 12-1 record leading up to the state title game with the loss coming at the hands of University. Behind Truck Edwards and Mookie Collier, Bluefield posted a 13-0 record heading into the matchup with the Polar Bears. The biggest eye opener for Bluefield was a 74-7 win over Oak Hill on October 20. As for the state title game, Collier, who now plays at Marshall, ran for 199 yards and a touchdown in the contest. Edwards, now a member of the Pittsburgh Panthers, amassed 81 yards and two touchdowns on a night in which the bruising tailback was featured on SportsCenter. However, for Bluefield it was quarterback Chandler Cooper who scored the go-ahead touchdown to clinch the 11th state title in school history, 29-26. The history and legacy of Bluefield Beavers football is one that is known well throughout West Virginia. On Friday, against a familiar foe, Cooper and Truck’s brother Juice look to add the 12thstate title. If the Beavers can knock off the powerful Polar Bears from the north, it will be a group that adds the latest layer of cement of the most prestigious program in southern West Virginia. Very interesting article, but Dickie Ward led the 1965 team to the Championship, and Pete Server was the 1967 Quarterback. I was honored to be a team mare to Pete in the 1967 season.